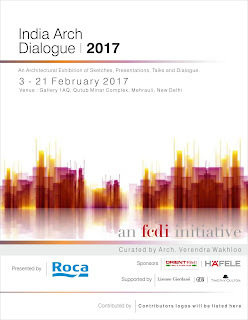 India Arch Dialogue 2017, An Architectural Exhibition of Sketches, Presentations, Talks and Dialogue. It will be held at Gallery 1AQ, a gallery in the foreshadow of the iconic Qutab Minar, an ancient Mughal monument from 3 - 21 February, 2017. With a vision to collate and curate seamlessly, diverse aesthetic milieu that inspire and lead to productive collaborative platforms at mass industry levels, IAD 2017 will host presentations and talks by 8 renowned international architects, Wolf D. Prix from Austria, Alexander Schwarz representing David Chipperfield Architects from UK, Jacob Van Rijs from Netherlands, Manuel Aires Mateus from Portugal, Sou Fujimoto from Japan, Roger Diener from Switzerland, and Patrik Schumacher representing Zaha Hadid Architects from UK along with 20 top design professionals Akshat Bhatt, Ambrish Arora, Arjun Malik, Priya Paul, Raghu Rai, Ravindra Kumar, Robert Verrijt & Shefali Balwani, Sabyasachi Mukherjee, Samar Jodha, Sandeep Khosla, Sandeep Khosla, Sanjay Puri, Shimul Javeri Kadri, Sonal Sancheti, Sourabh Gupta, Stephane Paumier, Sudipto Ghosh, Edmund Sumner & Jacob van Rijs. The show promises to be an exciting event, spanning over three weeks in conjunction with interactive special events on each of the three weekends.